I’ve been promising a look into our recently made-over living room, and today is finally that day. Now, I know you’re probably thinking, “How many times can one person redo a room in their house? !” and while I’m personally of the mind that a home is never technically “done,” there was a very specific reason for this most recent update. You see, John and I had been thinking about investing in a second Samsung Frame TV for our upstairs living room for about four or five months. You may already know about the one we have in our downstairs family room, and that it’s easily our favorite piece of technology in the house. 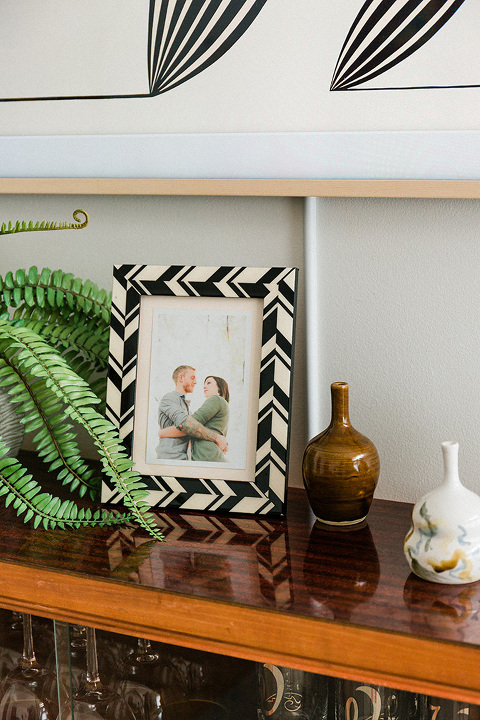 In case you’re just catching up, though, the Frame TV displays a piece of digital art when not in use, so the television literally transforms into a decorative accent the moment you switch it to its dormant art mode. Genius, right? Well, anyway we wanted to make our upstairs gathering space just as functional as the one we enjoy downstairs, so over the holidays we finally bit the bullet and ordered a new TV (albeit a smaller version of the 55-incher we have downstairs). That’s it right there in the photo below displaying a cool monochrome print. With the new TV in place, we decided to turn our attention to the furniture in the living room facing it. You know we’ve always been absolutely smitten with the vintage leather couch we used to have in the space, but it just wasn’t quite comfortable enough for lazy TV watching, so we ended up putting it in my office to turn that room into more of a lounge, and we put the overstuffed tufted couch that we had out in our sunroom in its place in the living room. Since we had spent so much money on the new TV, it was really important that we find a way to redecorate the living room on a next-to-nothing budget, and luckily we already had that cozy sofa on hand to use in place of the leather couch, which was really more for show than longterm seating, if you know what I mean. There were still a couple of hurdles to get over, though, which I’ll get to later in this post. The first problem was that I had never really loved the legs of the tufted blue couch as it was. You can see the original chunky block legs in the before/after graphic below. I was all for the cool teal color, the sharp lines of the silhouette, and the tufting—not to mention that it’s the most comfortable couch in the world. But those bulky legs had to go. **Sorry the lighting is so off between these photos. I know it’s making the couch upholstery look totally different, but I promise that it’s the same couch in both photos. Happily, the changing out of the legs couldn’t have been easier, and I’m now kicking myself for waiting so long. All we did was unscrew the old legs and put a set of new tapered legs that we ordered from Amazon in their place. The entire project took about 10 minutes, but the difference (at least I think) is pretty amazing. 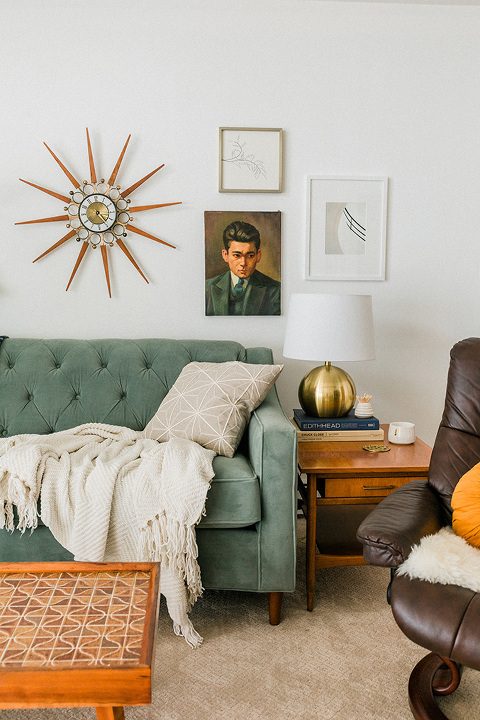 The updated tapered legs make the couch feel a little sleeker and definitely more mid-century in style. I also love that the richer wood tone of the new legs matches the rest of our wood furniture better than the original almost-black legs did before. 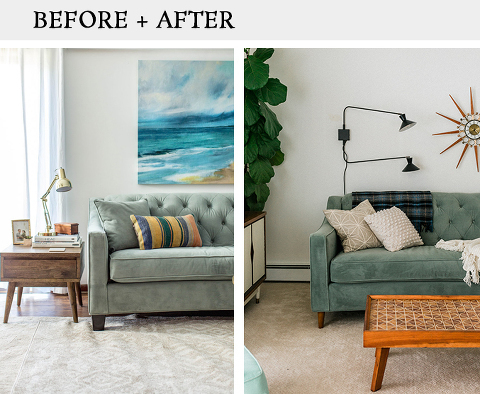 See how they’re almost an exact match to the antique teal side chair in the photo above? You might be wondering where our new leather side chair came from. It’s actually on loan from my parents who are downsizing a lot of things from their home before they move to our area in the next few months. While the piece isn’t exactly 100 percent my style, I do love the retro ’70s feel of it, and it’s beyond comfortable to sit in. The reason it’s the perfect addition to this particular space, though, is that it swivels, so it can be shifted to face the couch for regular conversation and twisted toward the TV at other times as needed. I might not give the chair back to my parents after all! Truth be told, the room took some getting used to. For the longest time this space was so much about looks. 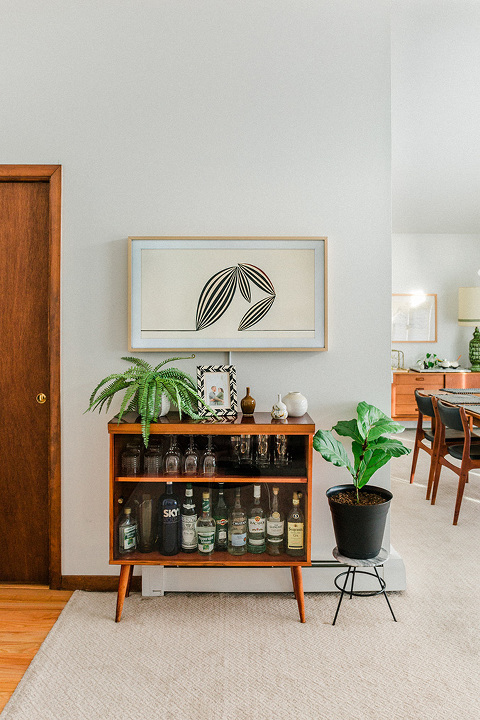 It was where we kept our favorite pieces of antique furniture (whether they were comfortable or not), and although we still spent plenty of time in the room before, it wasn’t exactly my top choice for lounging around any time of day. Now the living room is just as comfortable as the family room, and offers us a lot more flexibility in terms of gathering with friends and family. What do you think of the “new” room? Do you like the new art and furniture arrangement, or would you have personally erred on the side of looks over function? My favorite part, of course, is that we didn’t have to buy any new furniture—just $30 worth of new legs for a couch we already had! Feel free to leave your thoughts in the comments below.